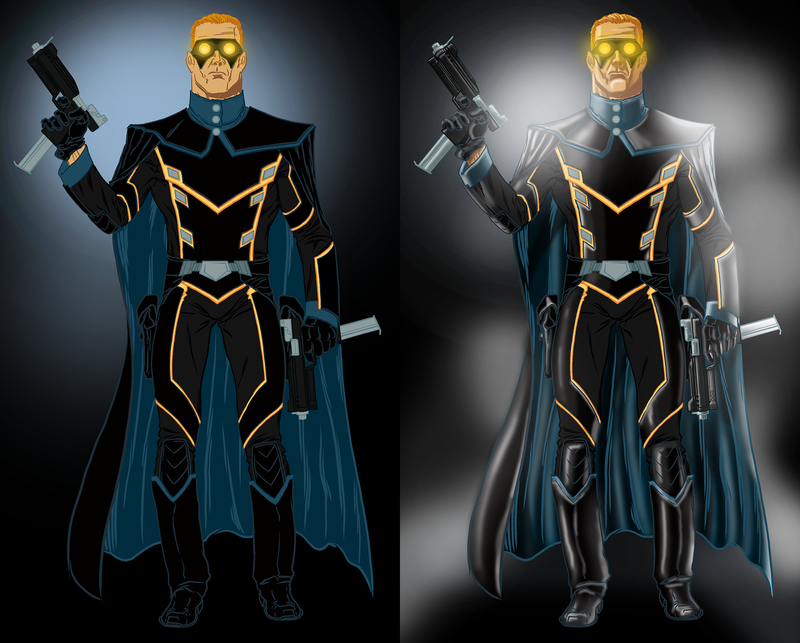 Whipped up Black Phantom here today and had a lot of fun playing with his colors. Originally I had him with a red cape but he looked too much like the Black Terror. Anyway, this guy's gonna be in a Midnight Confidential story I don't have a title for yet. I also took some time to do a quickie air brush render on him and I'm curious about folks' opinions on how it came it. If they like I think I may do it on more designs, just to get them popping out a little more. It may also be the style I end up using to color REVENGE OF THE OCTAGON (which is the whole reason I did the thing in the first place). My normal method of rendering takes too damn long so I've been trying to develop a quicker way of doing it. So, please, chime in. Say what you think. Don't worry, I won't bite -- not even if you hate it. It's just an experiment.